To the haters and supporters alike, THIS is why I marched. I hate labels because they are merely an excuse for us to judge someone we don’t know anything about. They are also a political means to divide, support ignorance, and create apathy. But for the purpose of this blog, I will say that my political views fall into the progressive category. I don’t call myself a Republican OR a Democrat, because both parties are pretty much corporate puppets. Ultimately, I will say that I care most about people, peace, and the planet. To say that I feel like the odd man out, would be an understatement. For most of my adult life, I was ignorant and apathetic of politics in general. I really did not know enough about issues to stand any ground either way. I mean, let’s be honest, there is a lot more that goes on in Washington than voting on gay rights and abortion laws. Our legislation is complicated, our economy requires an advanced degree to understand, and much of what really affects us is not talked about on the news. I did my civic duty, and I voted. I cannot tell you how many times, I voted for people whose names I had never even seen before. I based my decision on the group I identified with, or social issues that I heard about. At the age of 39, after battling weight and health issues for most of my life, I started doing some digging about food and health in America. What I discovered infuriated me, enlightened me, and liberated me all at once. I learned more than I can discuss in this blog, let’s just say, I came to understand that fat, unhealthy people made for a strong profits. Or better said, if we became a country that ate healthy food, and stopped getting sick, we could very well crash the economy. Everywhere I turned, I found the health of our people, and the health of the our planet not only ignored, but SACRIFICED for the sake of profits. There is something you learn, when you become a coach. “How you do one thing, is how you do everything.” And suddenly I looked at our great country in a very different light. If we were willing to destroy our own health, and our own environment for the sake of money, what does that say about the other decisions we make? Are they all for profits too? I would soon learn, that our prisons are FOR PROFIT. I would learn that while we refuse social programs that would benefit regular people in America, we socialize the losses of the rich, the banks, and the chemical giants. Not to mention that our tax dollars go to subsidize GMO’s, a horrifying animal agriculture system, processed foods, and oil and gas. Mind you, all of which contribute to our ill health, and the destruction of the planet. I would also learn that since about 1980, when it comes to annual pay increases, for the top 1% wages grew 138%, while wages for the bottom 90% grew only 15%. Think what you want, but this is not due to the top 1% working harder than the bottom 90%, this is due to the fact that our government, that should be run by the people, and for the people, has been taken over by large corporate interests. I don’t claim to know everything. I don’t claim to understand everything, but I am far more aware than I used to be. I am not okay with profits proceeding everything that really matters in our lives. I have had to take responsibility for my own ignorance, apathy, and selfishness, in understanding how we got to this point in the United States of America. I don’t sit here and blame the conservatives or the liberals, Barack Obama, George Bush, Hillary Clinton or even Donald Trump. If only it was THAT easy, to blame one person. Truth of the matter is that we all are to blame. We can point fingers at corruption, greed, and selfishness only after we take a good long look in the mirror. If you go with the notion that one person or side is to blame, then you think that one person or one side can fix the problem. Again, that is convenient thinking, and taking the easy way out. Truth is, WE all have to step up to fix the problems. If you are a student of history, then you know that change will never come from the top, and anyone that tells you differently, it lying to you. Change comes when millions of people stand UP together with common goals for all of humanity. If you want to change something in the world, you start with yourself. If you want to see people held accountable for their actions, you hold yourself accountable for your choices. You see, you don’t just vote, and then go home and do nothing. You don’t stand for pro-life if you keep blinders up to the 41 million children suffering in food insecure households in our own country, and complain about their lazy, welfare parents using food stamps to feed them. You don’t demonize the poor, the oppressed or the people that don’t think or look like you. You don’t get angry at people on welfare, and assume they are all taking advantage of the system. You want to talk about taking advantage of our system??? The fact that so many people willingly believe that THE most oppressed and impoverished people in our country are the ones who have the power to influence our economy, is, INSANITY. And it’s so convenient. We can continue to worship money, celebrity and all their beauty and glamour as being the “good ones,” as long as they label themselves like us, while looking down at those that have the least, as being to blame for all that ails us. It doesn’t require any research or any self exploration, or ANY empathy for our fellow man. It doesn’t require us to step into our own humanity. It doesn’t require us to take responsibility for our own greed and selfishness. I marched because I want to live in a country that has a moral economy. I want a country that has foresight and wisdom and puts people, peace, and the planet before profits. I believe that American’s are smart and innovative enough to do things differently. I marched because I know that social change will never come from the top. Please don’t tell me that I am whining, or cannot get over it. Please don’t tell me that I am disrespecting our great country, or the POTUS by marching. Our forefathers put freedom of the press, freedom of speech, and freedom to protest in the Constitution, KNOWING that the people had to keep our government in line. Our forefathers were wise, and had foresight, and knew that power could easily be taken away from the people, by the rich and greedy. If you can honestly look me in the eye and tell me that I have NO reason to question Donald Trump’s character or integrity, not to mention, his mental health, you are in denial or not paying attention. If you think I should roll over and play dead, then you don’t know history. If you think the POTUS is above the law, then you do not support democracy. If you think that he is not showing his tax returns because they are under audit, then you suffer from cognitive dissonance. I marched to hold our leaders accountable because not holding them accountable got us into this mess. I marched to hold myself accountable to my ideals and values. And I would have held Hillary Clinton accountable as well. If you gave Donald Trump your vote, you owe him nothing. He works for YOU now. He works for ME now. And I marched to let him know that I am paying attention. And yes, I will praise him for doing good things (he crushed the TPP, and I give him credit for that), but I will watch him closely. After all, he evaded the draft, he filed for bankruptcy numerous time, and he evaded taxes. And in his words, on National TV, he admitted to this, saying “there were loopholes he took advantage of” and that he proudly stated that he was not corrupt but instead “was a smart business man” for taking advantage of said loop holes. His tax returns, his refusal to divest from his business interests or put them in blind trusts, are loop holes that he told you with his own mouth that he proudly takes advantage of. He also knows that he could shoot someone on 5th ave, and his supporters would still follow him. Frankly, if I voted for him, I would find that terribly insulting. I have values, and I have ideals and I do not, and will not label myself a Republican, Democrat, Conservative, or Liberal and follow any crowd blindly. I will stand up for issues, and I will hold anyone and everyone accountable no matter what they call themselves. You see, I believe we all have far more in common than not. I believe that what is truly important, affects all of humanity. And I will never allow identity politics to create apathy, and ignorance in me again. Cindy I love your article, it expresses for me a lot of what I find difficult to put into words, without being too angry, judgmental or defensive. You gifted me a long time ago, a little coaching gem that changed the trajectory of my path. I marched too, a lot easier in CA with friends I have no doubt. We need more of your nuanced voice especially in Texas. I admire your courage. Thank you Vivien. Your words mean so much. Appreciate the time you took to comment. Thank you for this. I wish people who disagreed with the march would read it. So many I know hated the march because they viewed it as an abortion rights march, disregarding those who marched to show their concern for what the administration is doing, those who marched so that these actions won’t be normalized. We need to continue marching and letting our elected officials know that we will not sit quietly and let our values be destroyed. Science is not an opinion and “alternate facts” are lies. Our focus should not be on crowd size, but on climate change. We should focus more on lending a hand and less on building a wall. I could go on….but thank you for articulating so well what so many of us are feeling. Cindy, thank you for writing this. It is beautifully written and speaks what is on my heart. I feel the same way. I was shocked and disheartened to learn about the big business of food and mass incarceration. I developed a new perspective after watching “13th”. I am confused how Christians can turn their backs on refugees, immigrants or anyone for that matter, in need. I find that disturbing. It’s driving some people away from church and I can understand why. I’m grateful to be in a church with open arms and compassion to those in need and people of other faiths. I find it unsettling that Christians could justify choosing a one line item from Trump’s platform (pro life or SC Justice) regardless of the ramifications that vote held for humanity, decency, sanity, integrity, bullying, narcissism, etc… I’ve become a political activist and will continue speaking up for what is right, kind and compassionate. Thank you for your comment Holly. I hear you. The church lost me many years ago, but I never let go of the teachings of Jesus. I understand, and respect that people care about the life of the unborn, but I don’t understand not caring as much or more, about the life of the already born. Thank you for sharing your feelings. As I continued to read, I felt like you were sharing all the stuffed feelings and concerns I’ve had throughout this last year. I decided I needed to take personal action as well. 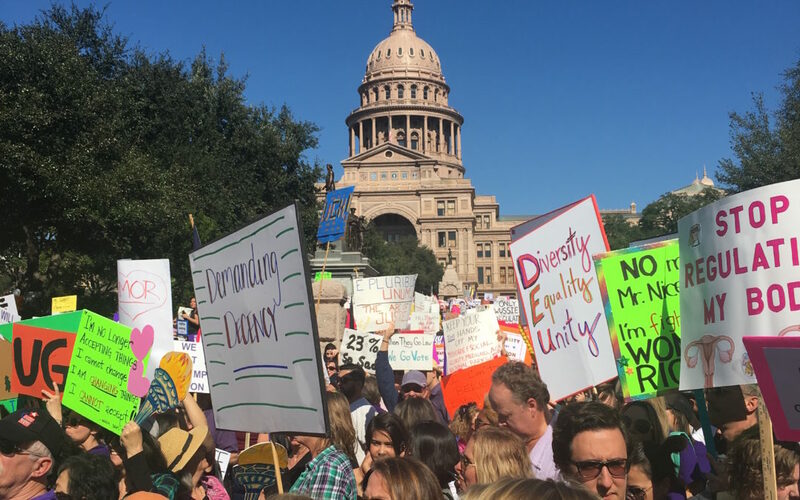 I couldn’t sleep the night before the march and I decided the next morning to march in Dallas. Scott was with me and it was the most liberating feeling! I had also called our Senators that week to voice my opinion. I have never done any of these things. It felt so good to be among like minded individuals. I could also see that my food choices (unhealthy) were getting tied to my frustration. I knew it was time to stand up. Thank you again for voicing “our” thoughts so beautifully.